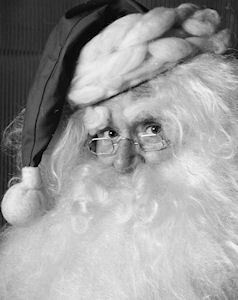 He appeared as Santa Claus wherever he was needed but primarily at charitable organizations, nursing homes, hospitals, orphanages, military bases and installations. Mr. Rielly never took any money for his appearances. Mr. Rielly was featured in the New York Times on multiple occasions and in hundreds of other newspapers throughout the United States. In 1982 he appeared on the television news program, PM Magazine hosted by Sheila Martines and Matt Laurer. In recognition of his generosity and community involvement, Mr. Rielly was the recipient of numerous awards and civic citations. Over the course of his lifetime, he received letters of recognition from celebrities and dignitaries from all over the world including: Eleanor Roosevelt, Senators Theodore Francis Green, Claiborne Pell, and John Chafee, Presidents Dwight D. Eisenhower and Richard M. Nixon, and even his Holiness, Pope John Paul II. On January 31, 1979 his name was entered into the United States Senate Congressional Record as "James D. Rielly – A truly remarkable Santa Claus from Rhode Island”.